Jonathan Morrison, Salt Lake City Bicycle Collective executive director, used to blend smoothies at the downtown Farmers Market’s bike valet ... with his bike. Modern-day inventors have concocted an array of bicycle add-ons to go green, from pedal-powered laptops to corn grinders to knife sharpeners, but none can stimulate taste buds like the bicycle blender. Ever been to the park, longing to have a cold, creamy, sweet beverage— but, alas, the trees don’t have outlets? 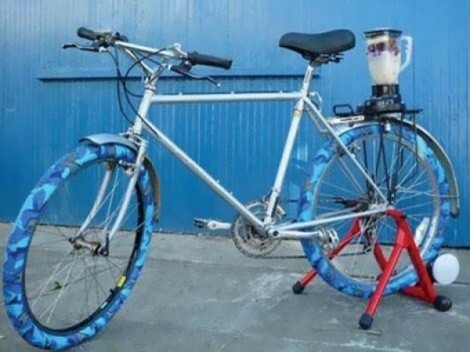 Luckily, anyone can burn calories to gain calories, since most standard bikes can be converted into a smoothie station with the right components. Essentially, the bike needs to become stationary, then an extra chain is run from the bike gears to the attached blender—on a platform—which moves on bearings as the biker pedals. Sounds easy enough. Instructions can be found online on sites like Instructables.com and, with a day’s work, equipping your ride only requires having a bike and buying a blender and parts—likely not exceeding $50. Bike parts can be bought cheaply, or worked for, at the collective. Also, Morrison warns that because of friction-induced heat, it’s necessary to buy an industrial blender. “It’s human nature to think, ‘I’m going to make the fastest smoothie ever,’ ” he says.